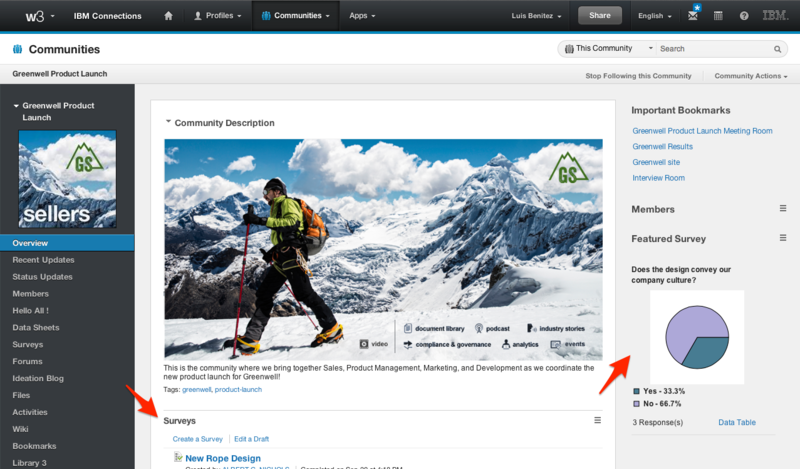 Socialize Me: Announcing IBM Connections 4.5 IFR1: Community Polls/Surveys for all! Announcing IBM Connections 4.5 IFR1: Community Polls/Surveys for all! Today, I'm happy to announce the availability of IBM Connections 4.5 IFR1 . This new release adds Surveys and Polls for communities at no additional cost to our IBM Connections customers. This capability has been available for a while but it was only as an added cost add-on. In this release, this capability is now out of the box. Use the built-in survey designer to create the questions and rules with no coding skills -- just drag-n-drop! As you can see from the screenshot above, you will have two new widgets available to you: "Featured Survey" which allows you feature a poll/survey right in the Overview page and "Surveys" where members can see all active surveys. Editing and creating the survey occurs directly within the Connections interface. Community managers don't have to learn anything new or any HTML coding skills. It's all visual and with drag-n-drop they can create the polls and surveys they need. Those of you who know me, know that I've been trying to make this available out of the box for some time, and today, we've made it happen! So don't wait. Go on and download and start taking advantage of this new entitlement!